That’s a risky title. When I worked at a restaurant many years ago the chef, wisely, noted that you should never call anything the “best this” or “world-famous that”. . . it’s annoying, it’s highly subjective, so on and so forth. I think this falls into a slightly different category. The folks at Food52 ask folks to submit genius recipes and I believe they define them as just plain smart, unusual, surprisingly delicious, and/or unexpected in their simplicity and success. I’ve been meaning to submit this recipe to them but in the meantime, here it is. And it has an irreverent title to boot! 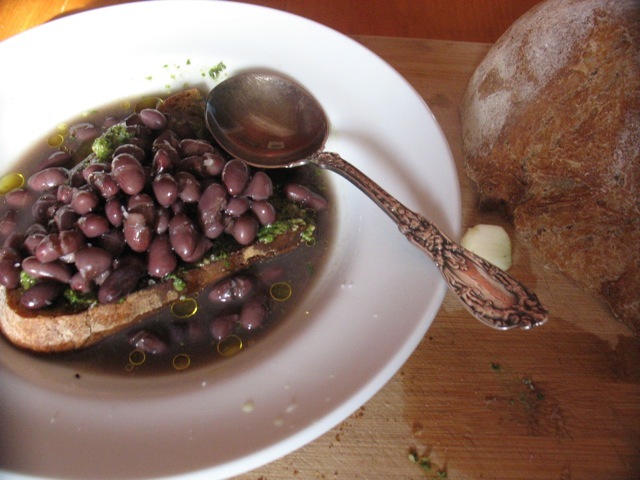 It’s toasted bread, rubbed with garlic, slathered with pesto and doused with brothy black beans. That’s it and it’s really, really good. Make it and tell me when you do and what you think. –inspired by Carol Boutard (of Ayers Creek Farm) who got the recipe from Nostrana which got the recipe from Anne Bianchi. It’s very simple to make. 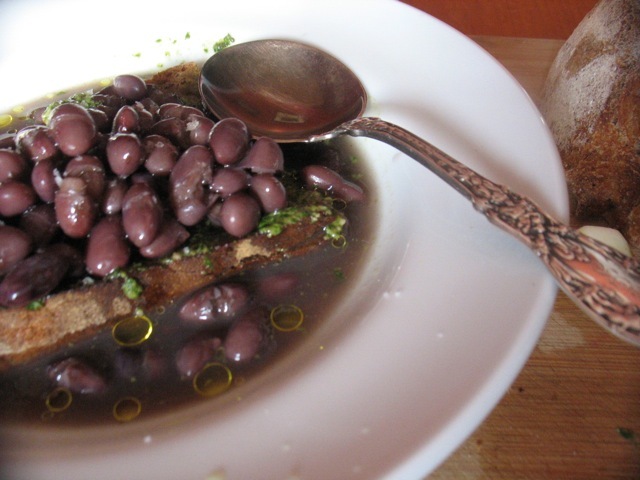 And if you have previously cooked black beans with their broth on hand by all means just use those. The garlic and pesto on the toasted bread add lots of flavor so don’t be put off by its simplicity. Drain the beans and place in a soup pot along with 3 cloves of the garlic, the onion, sage, 1 1/2 teaspoons kosher salt and enough water to cover by 2 inches. Heat to boiling over medium heat. Reduce the heat to low, cover and cook for 25 – 45 minutes or until beans are tender. Cut the remaining garlic cloves in half. Using half a clove for each 2 slices of bread, rub the bread with the cut sides of the garlic until the bread is perfumed with the odor, spread about 1 tablespoon of pesto on each slice. Divided the slices among 6 bowls and pour the bean soup into the bowls over the bread. Drizzle with olive oil. Serve hot. P.S. I’ve posted a bunch of new classes, shorter, cheaper and with new subject matter, including one for youth/kids and pantry stocking/quick meals one. I used Black Basque beans (grown by Ayers Creek Farm in Gaston, Oregon) this time around and they have a much lighter hue when cooked. Usually I use Black Turtle beans which are much darker. It works well with both or probably any other kind of black bean you have. Getting the best, freshest beans you can find is always good though.